Before students arrived at Colorado State University this fall, they were able to explore the campus virtually via an interactive map. The institution recently launched CampusBird, a campus map and virtual tour platform that combines a detailed 3D map with media such as video, images, interior layouts, wayfinding routes and more. 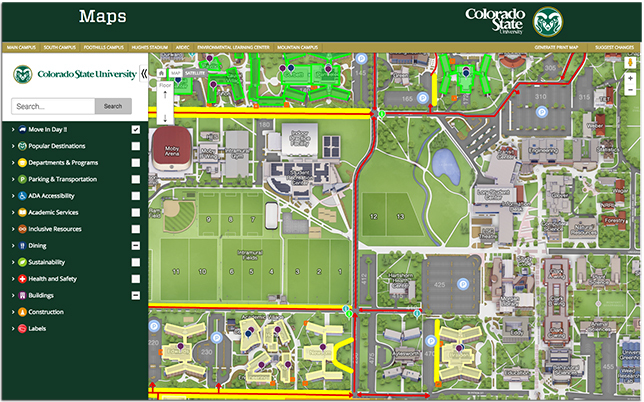 For the beginning of the 2016-2017 academic year, Colorado State used the CampusBird software to create a "Move-In Day" map that flags residence halls, information booths, driving directions, parking lots and "cardboard corrals," to help students navigate their arrival on campus. The map software also highlights ADA-accessible routes and entrances, sustainability initiatives, bike routes and other campus resources. Users can even explore new facilities under construction via 3D building renderings, flyovers and video. "Students, parents and staff love the 3D map, and the interactive media draws in visitors and gets them exploring the campus," said Martha Coleman, geographer with Facilities Management for Colorado State University, in a press release. "CampusBird is essentially a map-based information hub that any department can use. We also have plans for creating multiple virtual tours that will profile our bike-friendly campus, our history, our sustainability projects and other highlights." Colorado State's interactive campus map can be explored at the university website.